DICE was a Scandinavian band, gaining an immediate great reputation mainly among musicians. Their music is frequently compared to the major acts in the field of art-rock; GENTLE GIANT, YES, ELP, GENESIS etc. Though they have not existed as a band since the start of the '80's, they still have a quite large number of devoted fans. "Four Riders of the Apocalypse" is definitely worthwhile if you like bands like AMENOPHIS or MIRTHRANDIR. The music follows a theme of sorts, with occasional reprises and repeated rhythms. Sweden has always seemed to be a bastion of progressive music. 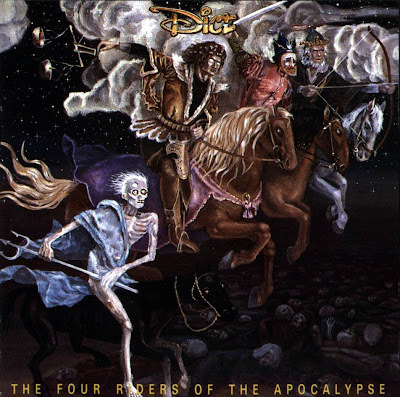 Dice were a top-notch symphonic rock group from the 1970’s with virtuosic musicianship and compositional skills, occasionally marred by less-than perfect vocals, but still an outstanding group. The story of their albums’ release dates are kind of convoluted, but since their all available on CD for good (hopefully), it’s probably fair to treat them as sequential. The first work they did was The Four Riders of the Apocalypse, an all-instrumental opus based on the biblical prophesy and Albrecht Durer’s engravings. The two shorter pieces (around 8 minutes each) are complex and fusiony, but surprisingly upbeat for such a dire themed album. The star of the show is one Orjan Strandberg who plays lightning fast but very melodic lines that are essentially just very complex riffs, around which the tracks seem to be based. Keyboardist Leif Larsson provides sturdy accompinament on organ, mellotron, and synthesizers. The two longer pieces are around 11 minutes long and are the highlights, in my opinion at least, as they go through a wide range of styles but still flow together nicely. Some people have complained about a few of the many sections like the part that sounds like "Larks Tongues in Aspic, part Two” (there is a section that sounds very much like that piece, but it only occurs briefly, so it’s more of an homage than a ripoff, and I have to admit that I didn’t even notice the similarity the first several times I listened to it since the rhythm is commonly used in a lot of prog music) or the quote from an old big band jazz piece that I can’t identify (I actually really like this part as it’s so unexpected). In spite of those brief controversial parts, the rest of the two long tracks are full-fledged masterpieces of symphonic rock that push all the right buttons and do a pretty good job of depicting the apocalyptic situations dictated by the concept. One of the great obscure masterpieces of 1970’s European progrock.